Visiting Highway 91 scored seven runs in the second inning Monday night and held on to edge host Boone Central/Newman Grove 7-6 at the Albion Sports Complex. While it is always disappointing to lose the season opener, Cardinal Coach Danielle Amen was pleased with the fight in her team. Things got away from the Cards in that second inning. Highway 91 first loaded the bases with a leadoff single and consecutive batters hit-by-pitch. BC/NG pitcher Keiley Tisthammer battled back to get two outs before Stewart’s double, a walk and a pair of Cardinal errors opened the floodgates. Emily Groeteke relieved Tisthammer in the inning, secured the final out, then held the Cyclones scoreless from there. 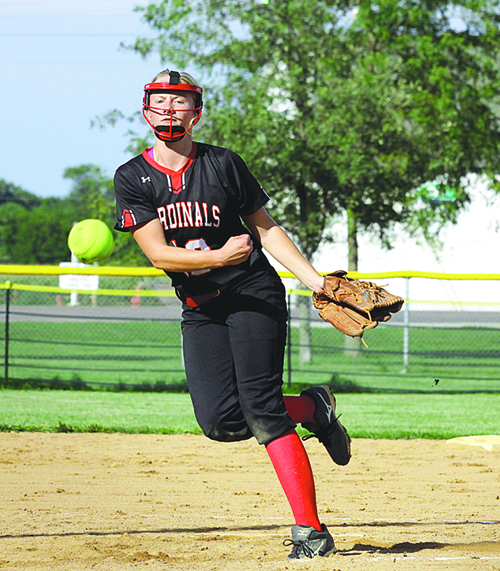 While Groeteke limited Highway 91 to just a single hit and struck out six over 5 1/3 innings, Boone Central/Newman Grove battled back from the 7-0 deficit. The Cardinals produced their own outburst in the third, scoring five runs. Hanna Seier and Paige Ketteler drew back-to-back walks, and Seier scored when Ashtin Kaumans reached by error. Lauren Hedlund then drilled a two-run double and Karlie Tisthammer belted an RBI double. In BC/NG’s final gasp, Kaumans led off the bottom of the seventh with a single, but was thrown out at second. Stewart then recorded the final two outs on a fly ball and her sixth strikeout.